Eastern Bank Job Circular 2018 has been published. Eastern Bank is one of the best commercial Bank in Bangladesh. Recently published Eastern Bank Job Circular Sales Executive, Cards Division (Trainee Assistant Officer). Eastern Bank Ltd. (EBL) Career to build a long-term sustainable financial institution through financial inclusion. Eastern Bank delivers optimum value to all stakeholders with the highest level of compliance everywhere now Eastern Bank published Sales Executive, Card Division. 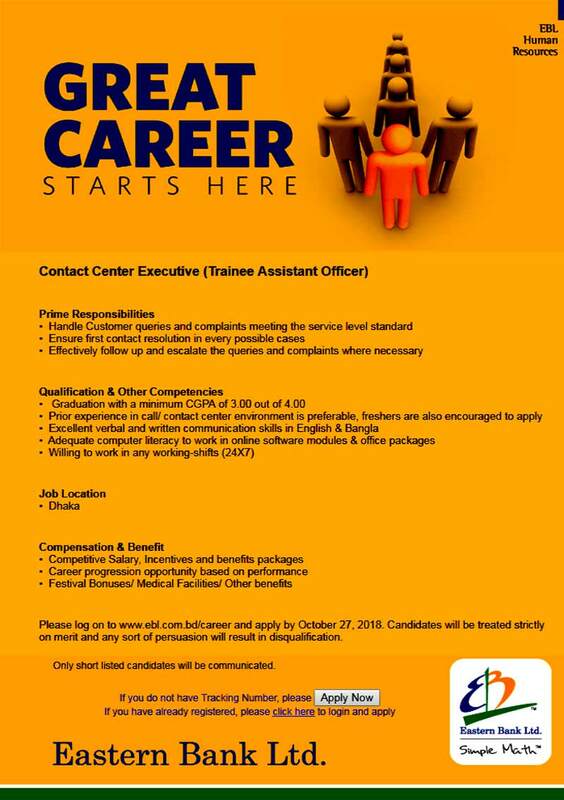 As part of its journey to build a winning team currently looking for deserving young graduates as Trainee Assistant Officer. Eastern Bank Job Circular 2018. Candidates will be treated strictly on merit and any sort of persuasion will result in disqualification. Only shortlisted candidates will be communicated. If you are interested in the career with Eastern Bank Ltd. (EBL) then you can register yourself anytime at Eastern Bank Ltd. e-recruitment system by filling Eastern Bank Ltd. online application form. Eastern Bank Job Circular Trainee Assistant Officer, EBL Securities Ltd. (EBLSL). Eastern Bank Job Circular 2018.